As we prepare to enter 2017, it's important to remember that you really never know when you're being watched, even when you suspect you're alone. A local woman who happened to snap a picture of a couple in the middle of a Rittenhouse Square marriage proposal is now looking to find out who they are, mainly so she can help them immortalize the moment. Claire Gibson posted the image on Facebook in hopes of finding anyone and everyone who might be acquainted with the couple. Gibson, a dog walker, initially considered approaching the couple to give them the photo but decided she didn't want to interefere with a special moment. Whether or not the couple planned to keep the news private for any length of time could quickly become a moot point. 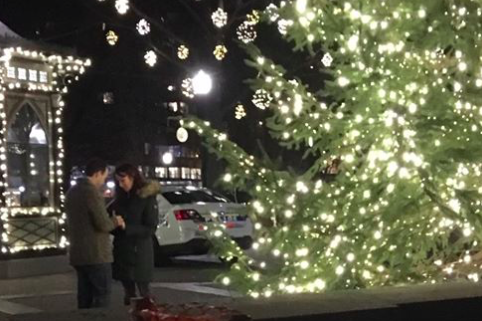 Once they're found — how many people get engaged at Rittenhouse Square every night — it will at least be a nice story for them to remember. Do you know this couple? Do them a favor and let them know they've been all over the news.